One of the benefits of being a food blogger is that sometimes people send me samples of things to ... well, sample. I love trying new things that I might not normally try. It's like those samples at the grocery store, except the samples are usually bigger than one bite, and I get to enjoy them in the comfort of my own home. First are snack bars from a company called The Good Bean. Billed as "the fruit and no-nut bar" these don't have nuts, egg protein, or gluten, and they've got 5 grams of fiber in each little bar. The interesting thing is that these bars taste like they have nuts in them. Or maybe it's that the texture fools you. They're a little chewy and a little crunchy with dried fruits and with chickpeas that mimic the nuts. I'd bet that if you gave them to someone to sample and didn't tell them the ingredients, they'd guess that they were eating some kind of nut. 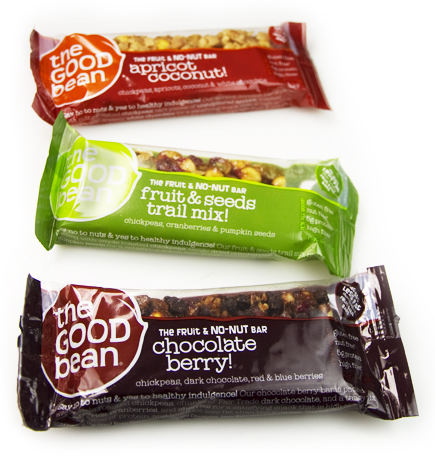 The bars come in three flavors - chocolate berry, fruit and seed trail mix, and apricot coconut. I'm not fond of coconut, so I passed that along to another willing taster who loved the bar. The verdict: these portable little bars would be absolutely fabulous to have in my purse for a quick snack when my errands run too long and I'm ready to succumb to eating something that's worse for me. Although I like nuts and I don't have any food allergies, the chickpeas made a good substitute for nuts, and they might actually be a slightly healthier option. Lower in fat, at least. And these little bars were pretty satisfying, too. They're small, but they did a good job killing my hunger enough to get me to the next meal. 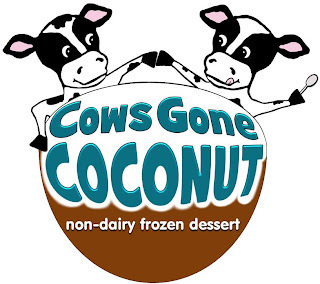 Next up was Cows Gone Coconut, a non-dariy frozen dessert. Sort of like ice cream, but with without any dairy products. This manufacturers didn't quite contact me the same way others do. This is a local company, with the product made right here in Longmont. One of the employees - a culinary student - wanted to interview me about blogging for a paper she was writing. After our chat she gave me a container if the product to try. You might recall that I said I don't like coconut. Truth is that I don't like the texture of coconut. The flavor isn't on my top 10 list, and it's not something I'd seek out, but I don't run screaming from the room when it's around. The flavor I got was salted caramel walnut, and I've got to say that the coconut flavor was pretty subtle. It was there - I knew it was there - but it wasn't smacking me in the face. The salted caramel helped a lot. The texture isn't quite the same as super-premium ice creams - a little harder and icier. But I'd bet it was also lower in fat. 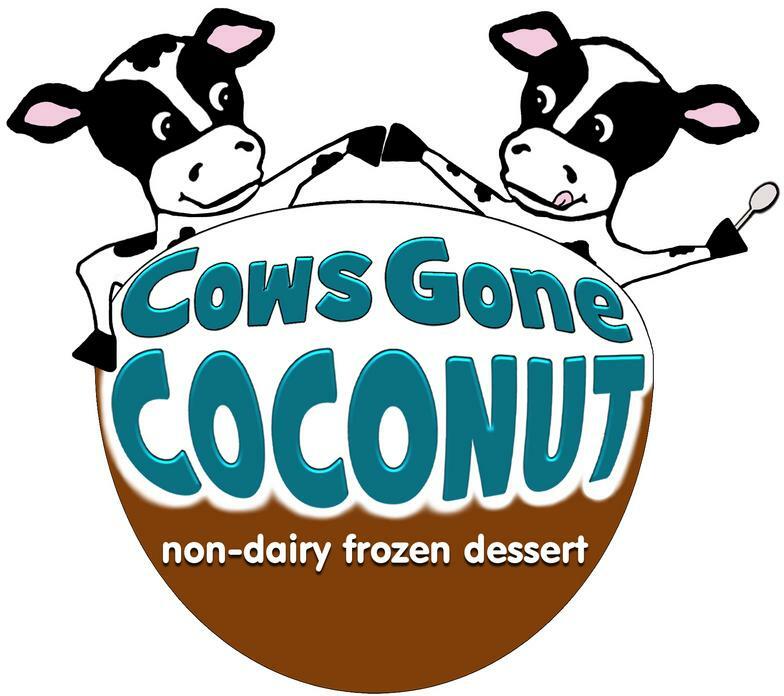 If you love coconut or if you can't have dairy, soy or gluten, this is the product for you. Well, it's the product for you if you live somewhere near me. This isn't in wider distribution, but you never know how quickly a company will grow. Snackle Mouth. It's described as a granola nut cluster. Sometimes I wonder if the Boulder area has more granola companies than average. It sure seems like it. I've sampled nut-free granolas and I've tried oat-free granolas. And there are granolas with a lot of oats and just a few nuts. Dried fruit, or no fruit. Honey, maple, sugar, or agave. Or no sweeteners. No two are alike, that's for sure. 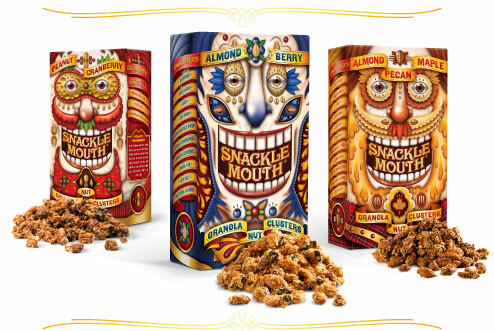 One thing that sets Snackle Mouth apart before you open the packaging is the packaging itself. It's interesting, that's for darned sure. I saw them on a shelf at a local store, and I've got to say that those crazed faces sure stood out. Interestingly, the company website lists three flavors, Almond Berry, Almond Pecan Maple, and Peanut Cranberry - but I got a fourth box as well - Bacon Maple. Hmmm.... was this a secret flavor? A test batch? If you think of granola as being flakes of oats combined with other stuff in a loose mixture ... well, that's not what this is. Instead, it's clusters of stuff. Lots of nuts surrounded by a slightly sweet mixture that looks like it might have been crumbly at one time, but that is now clumped around the nuts. It reminded me vaguely of the nuts that come in Cracker Jack, but less sugary and more better for you. Yes, I know that's grammatically incorrect. I'm being humorous. The fact that this wasn't over-sweetened made me happy. It's got a little sweetness - just enough to keep it from being savory - but not so much that it's like eating candy. I'm not a huge fan of granola that's mostly oatmeal, but this stuff had me reaching into the bag over and over. What I liked (a lot) was that the flavors really were different from each other. It's not like some brands where one thing is changed, the proportions of the main ingredients are changed, and it's supposed to be a new flavor. There were enough differences here between the flavors and ingredients to make them truly different flavors. As for the Bacon Maple, the maple was the primary flavor. I'm not sure that I would have guessed that it was supposed to taste like bacon if I hadn't read the box. Not saying I didn't like it - I did - that maple flavor was just right. Then again, maybe I haven't sampled enough. There are still a few bites left. While the no-nut bar would be my choice for an on-the-go shove-it-in-my-purse snack, these granolas would be my choice for and at-home snack (which, frankly, is when most of the snacking occurs around here.) I usually have some kind of nuts around for that sort of snacking and these would fit right in, with the added value that they've got the grains and fiber. I'm also thinking they'd make an interesting ingredient in baking. Maybe cookies. I'll have to work on that, if I can keep from eating them.